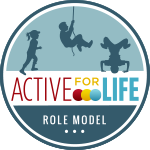 Stroller Running – I finally did it! It’s been a while since I’ve gone for a run – my own fault – no one else to blame. After thinking a lot about last Monday’s Boston Marathon, I thought I needed to get back to pounding the pavement on a regular basis. But with baby H 4 and a 1/2 months old now I have been struggling to get out. So, Thursday I finally got out with her in the stroller. Running with a stroller is HARD WORK! My husband and I both geared up for a run, we got Hilary in her car seat and then left in the same direction for our runs. He would be going in a different direction then us: much further, more hills and way faster than us. However, I would be pushing the stroller: 14 pound baby plus the weight of the stroller which turns out it’s 52.5 pounds (via Sear’s). Yikes! I learned the hard way that running with a monster of a stroller is super hard – but you make do with what you have, right. RIGHT! 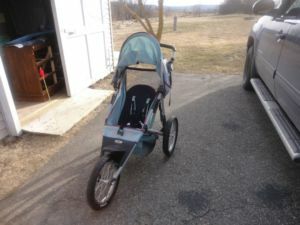 I decided that I wanted to invest in a jogging stroller and found one online: second-hand for $100. I’m thinking that running with a stroller is going to whip me into shape; hopefully in no time…..these roads won’t run themselves! I was completely exhausted after this run, minus the fact that I have not run in weeks…okay months, pushing a stroller is hard work. I am finally on my way and hoping this new stroller will help get me and Hilary back into running. Post run survival mode …. I think it’s time we put those shovels away, eh! 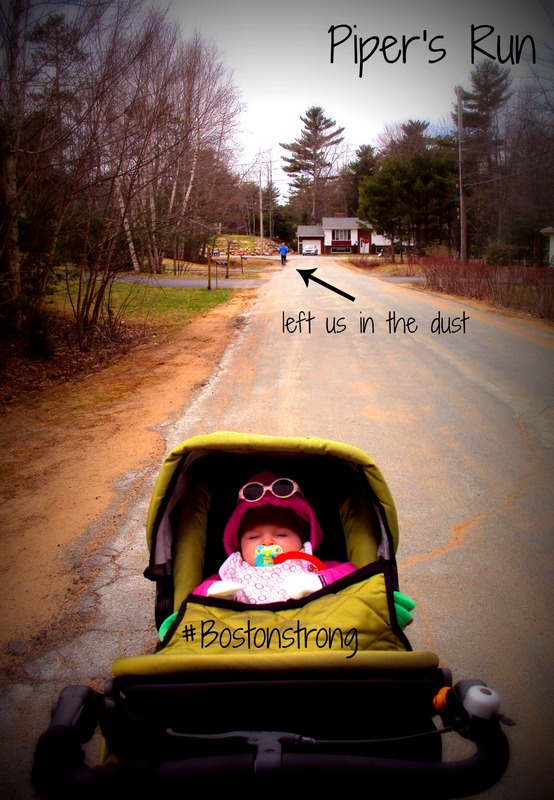 What was your first jogging stroller experience like? 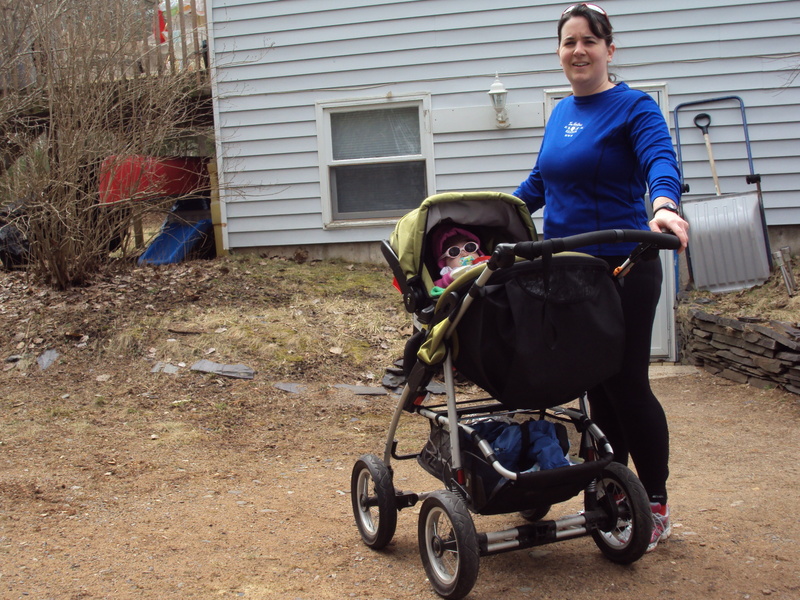 Did you start off with a normal stroller or purchase a jogging one? ← Monkey Update: 4 Months! I started with a jogging stroller and they are great!! I can do it one handed so my other arm can still move with me. I hope it works out well for you and find it as enjoyable as I did! Congrats on trying to run again! My son is 11 months ol and I’m 18 weeks along with number 2. I haven’t been jogging these days and miss it!! Congratulations on your pregnancy! I ran up until 18 weeks pregnant with baby H and then had to stop – that was so mentally hard for me. All the best. That’s great your husband can be with your little one. Baby H is going through a stage (we hope) of freaking out in Daddy’s arms – it’s hard on everyone. 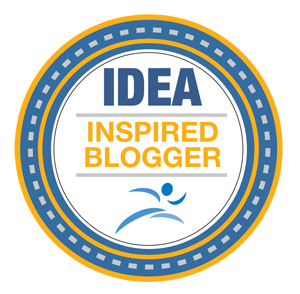 I was thinking about a double stroller but I know my almost 3 year old wouldn’t sit too long in it right now and thought it might be good to start with a single one and move up to a double stroller once I master the art of running with a stroller! I’d love to have a BOB someday….dreams…. Congrats on getting out there. I’m glad you got a jogger though! Using the car seat on top is a tipping hazard! Have fun!! 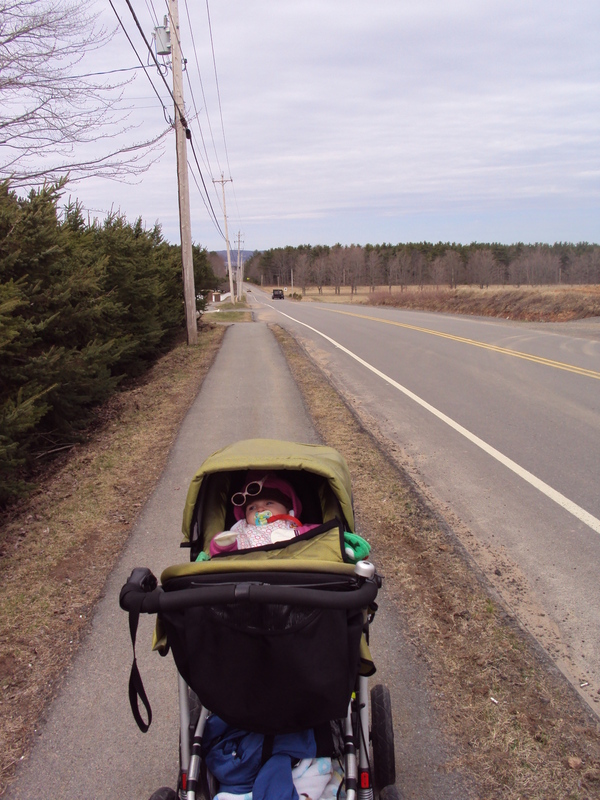 The Quinny stroller I have is great, the car seat locks in and the clips again….great for trails/off road but not running. So heavy too. I am really happy to have a proper stroller for running. Good for you! It will give you lots of incentive to get out there now. Congratulations on finding a good buy, too. Yes, now I have zero excuses! I always love a good buy. HAVE to run with a jogging stroller! makes a world of difference. found one around $100 at Costco but that was (so) long ago! I used to push it one-handed. had to use the free hand to keep my rhythm and then would switch. great way to put fussy baby to sleep–some great memories. good luck! Thanks Amy. Yes pushing with one had is challenging, I’m not used to holding something when I run…fun times ahead! YAY!! I try to take my 2 1/2 year old walking/running at least four times/week in the jogging stroller. She LOVES it. Our oldest (almost 3) loves to run and walk…I feel lucky. She’s going to be an active kid.